Signature of a treaty, in many cases, does not result in any formal legal obligations for the particular country. 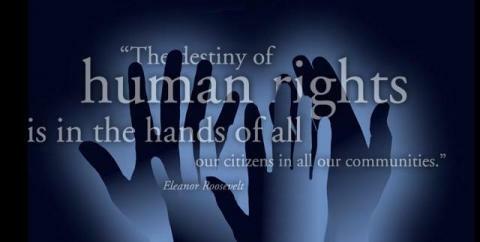 However, it does require the state to refrain from any acts which would defeat the "object and purpose of the treaty". Signature is often an expression of general support by the country for the treaty's aims and the general commitment of the government to begin the domestic legal requirements for ratification. Of course, a government may take a long time to ratify a treaty (due to domestic political considerations, for example, […]). Treaties are normally open for signature for a certain period of time (as set out in the treaty itself). Enabling legislation gives the Government the authority to enforce the concordat and is the final step. A simple example of this is a law stating that the concordat is approved as a treaty, and is incorporated into national law. Generally this "enabling legislation" is rubber-stamped. Treaties were meant to settle international issues peaceably. They serve to end wars, extradite criminals and preventing overfishing and pollution. 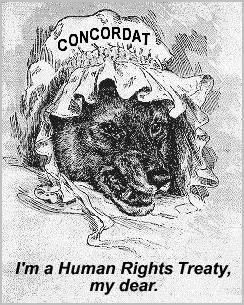 Treaties were not designed to circumvent separation of church and state — yet that is exactly what concordats do. A concordat uses the machinery of an international treaty in order to oblige a country to give privileges to one particular religious organisation inside its boundaries. The advantage of casting a concordat in the form of an international treaty is that this generally overrides national legislation. Because a treaty is an agreement between several countries, one of them cannot, without good reason, simply walk away from the commitment. Thus, following nineteenth-century precedents, Article 27 of the Vienna Convention on the Law of Treaties clearly states that one party cannot invoke its "internal law" to justify breaking a treaty. This obligation is felt even more strongly in terms of human rights treaties: no country can simply decide to violate people’s most basic rights. Concordats are clearly a powerful legal instrument. They enable the Vatican to use for its own ends the legal precedence often accorded to international treaties, in general, and human rights agreements, in particular. Unfortunately, human rights lend themselves to manipulation because they are not absolute: they are a bundle of trade-offs where giving up a measure of freedom in one area helps to ensures it in another. The Vatican can distort the whole system by proclaiming one right absolute and then letting it infringe on other rights. For example, the European Union human rights lawyers warned that the Slovak “conscience concordat” threatened important human rights, such as access to health care. This draft concordat manages this by defining "freedom of conscience" as "freedom of Catholic conscience", by which is meant, not the norms of most Catholics, but the formal doctrines of the Church. It then proceeded to declare the imposition of Church doctrine, defined as (Catholic) "conscience", to be an unrestricted "human right".